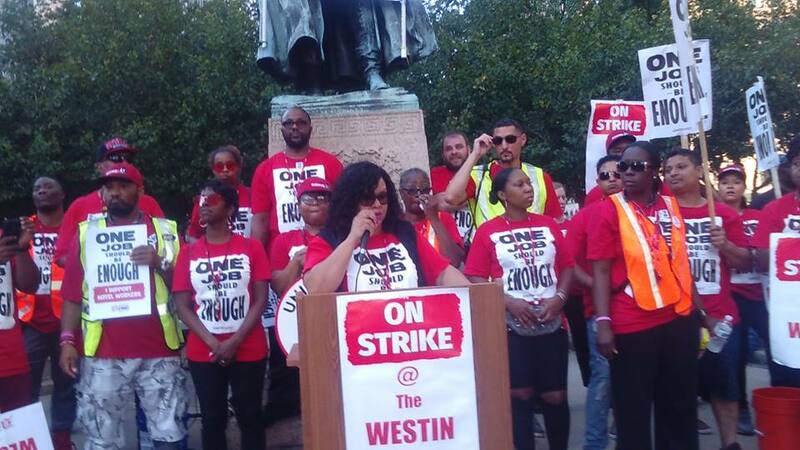 During the early morning hours of Sunday October 7, members of Unite Here Local 24 in Detroit went on strike against the Westin Book Cadillac Hotel located downtown on Washington Blvd. 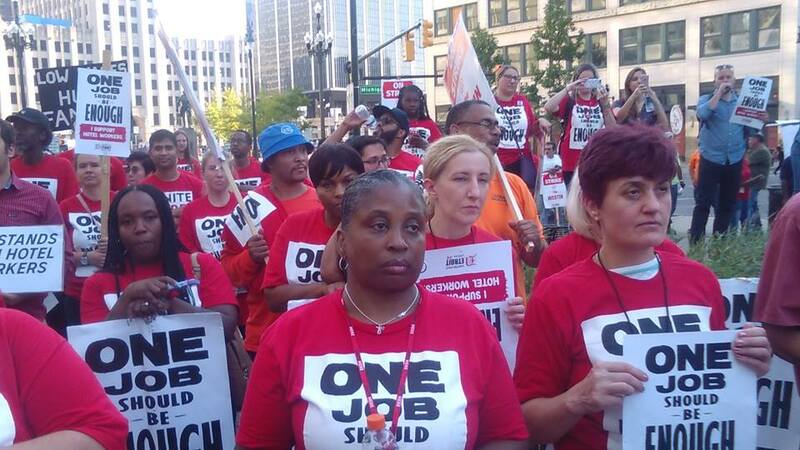 In Detroit, the Unite Here employees are asking for $2.00 more per hour. One worker said in a statement to the press that his salary has only increased by 70 cents per hour over the last ten years when the hotel was re-opened amid the Great Recession. A dominant corporate media narrative in Detroit is that the city is experiencing a major upsurge in business development in the downtown and midtown districts. Many new restaurants have opened along with expanded hotel space largely servicing conventions and tourists. However, this purported “boom” in business profitability in downtown and midtown does not take into consideration the wages and conditions of employment for workers in the hospitality industry. Neither does this line of thinking recognize the rising cost of living within the downtown and midtown areas as it relates to housing availability, the skyrocketing of rents and other problems associated with the lack of public transportation. On Tuesday October 9, Unite Here Local 24 called for a support rally to boost their demands surrounding the strike. Some 500 members and officials of other unions as well as community people came downtown to walk the picket line and speak out against the practices of the Westin Book Cadillac Hotel. Various unions were represented including the UAW, Metro AFL-CIO, Michigan Education Association (MEA), SEIU, among others. Speakers at the October 9 rally in front of the Westin Book Cadillac Hotel assailed the corporation for not giving the workers a raise. With the lowering of the official jobless rate in the U.S. to 3.7 percent many workers believe that there should be a significant increase in real wages. Unfortunately, this has not been the case at all. Demands for higher wages among service employees have been taking place now for the last five years. The Fight for $15 campaign in Michigan recently staged a series of demonstrations on October 2 in conjunction with other workers across the country. Members of Fight for $15 in Detroit blocked traffic along Woodward Avenue leading to over 20 arrests. Earlier that same day in Flint, a vehicle struck a crowd marching through the city calling for $15 per hour in minimum wages and union representation. The Flint law-enforcement authorities claimed that the incident was an accident which resulted in the taking of eight people to hospital for injuries. Compounding the slave-wages paid to many workers in the hospitality and other industries is the inhumane policy of widespread water shut-offs in Detroit. Although this has been a problem for many years, the situation reached critical proportions during the imposition of emergency management and bankruptcy in 2014. 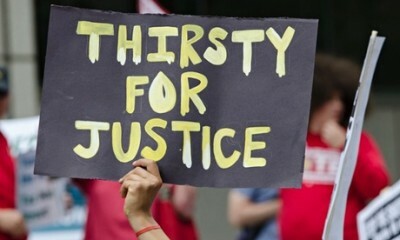 Demonstrations, legal challenges and other opposition activities prompted some initial reforms in the summer of 2014 when the City of Detroit declared a brief moratorium on water shut-offs allowing many households to make arrangements for the payment of arrears and the resumption of their services. However, these inadequate measures do not address the underlining reasons for the crisis which is the usurious bond issuances of financial institutions which drained hundreds of millions of dollars from the Detroit Water & Sewerage Department (DWSD) system. Water services are still being shut-off at an alarming pace. Rate charges are far too high for a city which is still ranked as the most impoverished among major municipalities in the U.S. Additional drainage fees, commonly referred to as a “rain tax”, are tantamount to extortion since the refusal to pay these costs can result in the termination of services. A regionalized Great Lakes Water Authority (GLWA) was also illegally established in 2014 absent of any public debate or referendum on the restructuring. Decisions made by bank-led emergency management officials to disconnect the City of Flint from the DWSD resulted in the poisoning of the water in that city where thousands have been inflicted with elevated lead and copper related diseases along with a Legionnaires outbreak that killed several people. Just recently in Detroit, the newly-created Public Schools Community District (DPSCD) announced that it was shutting off water fountains in buildings due to lead levels discovered through testing. At present students are drinking from packaged bottles and portable commercial tanks. There are no feasible plans to replace fountains, lead service lines or other possible sources of the contamination because the new school district crafted by the conservative state legislature cannot sell bonds to fund improvements to the system. 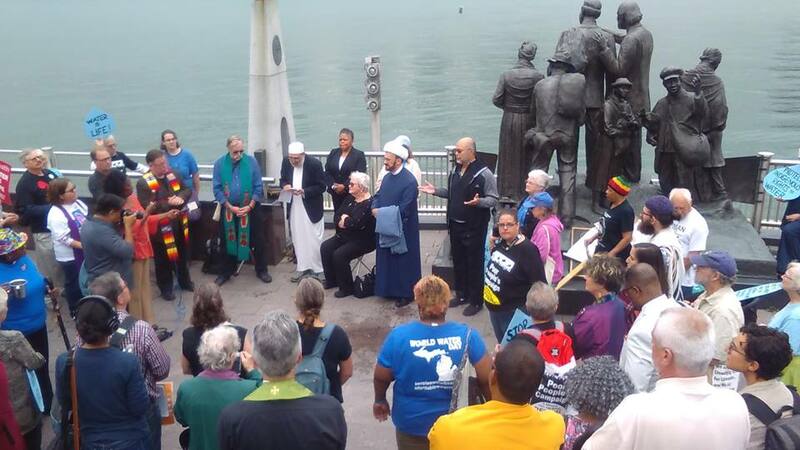 On October 4 an inter-faith coalition of clergy held a demonstration and press conference downtown. The participants marched from the Detroit Riverfront at the Underground Railroad Monument to the Spirit of Detroit right outside City Hall. The spokespersons for the alliance demanded a water affordability program for the city. Rev. Dr. JoAnn Watson, a former member of the Detroit City Council and author of an affordability plan while she was in government, noted that the city was surrounded by fresh water and consequently there was no need for shut-offs. Another major aspect of the Detroit economic crises is the systematic relocation of people out of many areas of the city. An example of this phenomenon is the attempt to evict residents from the Park Avenue House Apartments downtown. Residents received a “30-day Notice to Quit” in early October from the management company running the building saying the apartment had been sold to new owners and everyone had to move. A brief investigation by the Detroit Free Press revealed that there was no evidence of a change in ownership. This building is one of the few remaining in the downtown area where the rents are affordable for low-income residents of the city. At the same time, there are the continuing problems related to property tax foreclosures. The Moratorium NOW! Coalition has waged a campaign over the last three years to halt property tax foreclosures since they are based on illegal assessments fostered by predatory lending of the banks extending from the late 1990s to the beginning of the Great Recession. Although a class action lawsuit filed by the Michigan ACLU and the NAACP Legal Defense Fund was settled out of court in July, the outcome of the settlement was so narrow that it merely focused on those who were eligible for poverty tax exemptions in the city. Even at this level, it would take a Moratorium NOW! Coalition effort which mobilized community activists to canvass those facing eviction forcing the city administration of corporate-Mayor Mike Duggan to extend the deadlines for participation in the purported “buy-back program”. Nonetheless, approximately 1,000 owner-occupied homes were placed on the market for sale in the auction which takes place every September and October. Even more egregious is the fact that hundreds of millions in Federal Hardest Hit Funds, which should have gone towards keeping people in their homes, were siphoned off to the Detroit Land Bank Authority (DLBA) for the purpose of tearing down homes at inflated costs resulting in what appeared to be “no-bid” contracts approved by the DLBA and the Duggan administration. Despite the fact that the DLBA and the Duggan administration are being investigated for these practices by the federal government, the funds have still not been utilized for what should have been the intended objectives of stabilizing neighborhoods in the aftermath of the Great Recession. Almost all of the so-called “developmental investments” in Detroit are centered in the downtown and midtown districts leaving the neighborhoods and small business areas where the majority of the African American population resides, to rot and suffer from continuing over taxation and abandonment. The City Lab project is scheduled to come to Detroit for a conference at the Westin Book Cadillac beginning on October 28. This is the same hotel where the United Here Local 24 workers have been on strike for nearly two weeks. City Lab is yet another effort to remake urban areas in the U.S. and worldwide in the image of Wall Street. The conference is sponsored by Bloomberg Philanthropies and The Atlantic publications. Invited speakers include corporate CEOs such Mary Barra of General Motors whose headquarters is located in downtown Detroit. The program advanced by City Lab provides no real promise for the majority Black and working class residents of Detroit. It is more of the same top-down approach to urban development whose outcomes will result in further gentrification and dislocation of the nationally oppressed, working class people and impoverished. Moratorium NOW! Coalition will host an alternative “Teach-In on City Lab: Real Detroiters Speak Out” on October 28 from 1:00-5:00pm at the St. Peter’s Episcopal Church near the downtown area. The event will feature four panel discussions aimed at addressing the underlying causes of the housing, water services, educational and wealth transferal crises impacting Detroit. This Moratorium NOW! Coalition Teach-In will emphasize the need for the mass mobilization and organization of the people to fight against the racist and anti-worker policies of those currently running the city. After the Teach-In participants will demonstrate outside the Westin Book Cadillac in protest against the City Lab Conference. Recognizing that the ongoing strike by service workers at the hotel where City Lab is scheduled to occur could result in a public relations disaster for the Bloomberg and Atlantic conference, the Detroit News reported on October 15 that the big expensive gathering will be moved to another location if the labor dispute is not resolved. Whether the strike is settled by October 28 or not is almost a secondary issue. The contradictions developing in the city of Detroit and around the U.S. will continue to result in the widening gulf between the have and have nots. Only a fundamental transformation of the political and economic system in the U.S. can alter the current social situation. This so desperately needed change must be initiated by those most impacted by contemporary problems facing growing numbers of people inside the country.